Get your $95 Driver Helpful DOT Physical Exam from Dr. Quintero located on NW 82nd Avenue in Doral, Florida. Need your DOT Physical Exam Today? We know your time is valuable! We will get you back on the road in no time. Same Day Appointments are Routine! (Click Here) to schedule an appointment online or call us at 305-406-9636 to schedule Now! Worried About Passing Your CDL Physical Exam? Dr. Quintero knows how important it is that you continue your livelihood as a commercial driver. We will take the extra steps to keep you on the road. With her extensive knowledge of the DOT Physical Exam medical guidelines, Dr. Quintero will steer you through the DOT Medical Exam requirements so you can Keep on Truckin’. Not sure if your medical condition will affect your driving status? Just give us a call before your appointment. We are here to answer your questions. Whether you are just traveling thru Doral, Florida or one of our local drivers, we are here for you! If you’re looking for a DOT Physical Exam or CDL Physical Exam in Doral, FL, you’ve come to the right place! Dade Testing provides Non-DOT Occupational Services: Our office provides physical exams, alcohol and drug testing services for non-dot regulated companies, industries and municipalities. setting. Please call for additional information. Drivers: Want to save time? Download the DOT Physical Exam report form by clicking the link below. Filling it out the form before your appointment will help us get your DOT Medical Exam completed quickly. St/Doral Blvd, turn left at NW 82nd Ave. From Turnpike, Ft.Lauderdale: South on Florida's Turnpike, to the Palmetto Expwy/SR-826 W exit, take the ramp onto Palmetto Expy/ SR-826 W, take the NW 36th St W exit,turn right onto NW 36th St/Doral Blvd, turn left at NW 82nd Ave.
right at the fork, follow signs for NW 41 St E onto NW 41st St/Doral Blvd, continue to follow Doral Blvd, turn right at NW 82nd Ave.
36th St, continue on Doral Blvd, turn left at NW 82nd Ave. From I-395: west on I-395 W toward Exit 1A, west on the DolphinExpy/SR-836 W,take exit onto Palmetto Expy N/SR-826 N, take the NW 36th St/SR-948 W exit, turn left at NW 36th St/Doral Blvd,turn left at NW 82nd Ave.
Maria Quintero DC, CCSP, DAAPM, National Registry Certified Medical Examiner (NRCME) is a graduate of the University of Texas at El Paso in 1985 and Texas Chiropractic College in Pasadena, Texas in 1989. 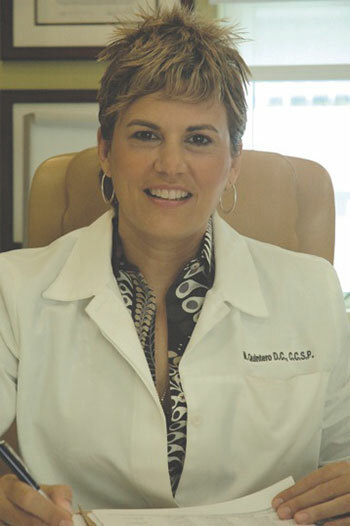 She maintains a private practice in Doral, Florida along with being on staff at the Sanctuary Surgical Center in Boca Raton, Florida, where she performs manipulation under anesthesia. Dr. Quintero is a certified chiropractic sports physician, clinical massage therapist, aesthetician, personal trainer, Diplomate of the American Academy of Pain Management and Medical Legal Professionals. She has more than 25 years of experience. Licensed in Texas and Florida, she is a board member of the Florida College of Natural Health for Medical Massage. Along with her many duties she is also a Florida Chiropractic Board Examiner, fluent in both english and spanish. Dr. Quintero is a seasoned chiropractor, with vast experience in the personal injury arena. Her extensive training and experience will assure you of the best settlement possible. If necessary Dr. Quintero will go to court for you and testify as an expert witness to your injuries. She works closely with your attorney to make sure that this process is as smooth as possible and is settled in the shortest amount of time. Her detailed and meticulous medical narratives will document all possible lesions due to the motor vehicle accident. She will order any diagnostic tests necessary to include MRI's, NCV, CT Scans. EMG, X-rays to document and diagnose your injury. Dr. Quintero will fulfill all necessary requests either from your insurance company or your attorney to help resolve your legal case. She is a available for a free consultation with no obligation. You may email your questions to drq@carcrashdoc.com.